Saturday 2nd October 2004 saw the occurrence of a simply historic event at the home of sumo in Tokyo. In front of 9000 privileged onlookers, the 67th yokozuna, Musashimaru Koyo, put an official end to his fine career as a rikishi, begun in 1989, and during which he raised the Emperor's Cup 12 times, the greatest number for a foreigner and the 6th most in modern sumo (post-Edo, from 1868). It seems more than likely that the fiery Asashoryu will surpass Musashimaru, but the latter will always be remembered as the end of an epoch, that of the Hawaiian dinosaurs. Of the 25 Hawaiians who have tried their hands in the Japanese archipelago, only Takamiyama, Konishiki, Akebono, Musashimaru and Yamato have reached the top division to amass a mere trifle of 27 yusho between them. Impressive statistics, which will not be continued� The end of an epoch! Reminded of this, Musashimaru, who was present at and participated in the danpatsu-shiki of his elder Hawaiians, stated that he had been deeply moved, that he would have problems holding back the tears and that he was sorry to be the last of the Hawaiians. Events did not prove him wrong. If you have never been at a training session, it will be hard for me to describe for you the superhuman strength of Musashimaru, who made the windows of Musashigawa beya shake when he exercised at the teppo (hitting a wooden pole with the palms of his hands). On the other hand, there are many anecdotes that give a flavour of his great sense of humour, which became more restrained after he reached the top rank. Here is one that the good fellow likes to tell laughing. When he arrived in Japan at Musashigawa, the young high-school student, a star of American football in Hawaii, could not speak a single word of Japanese. Right at the bottom of the sumo ladder, he should have carried out all the household chores laid down by his elders. But, as he did not understand what he was supposed to do, the elders would, more often than not, do these tasks instead of him, while explaining them to him. When the young Musashimaru is finally able to understand what the other wrestlers are telling him, he discovers that he is already ranked above them and no longer has to do chores for them. 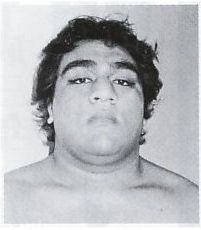 And certainly the Hawaiian does not dawdle on the way, seeing that he wins 25 of his first 27 bouts and finds himself at the top of the makushita division in only 8 months. Besides his natural tendency to come and chat with the fans, Musashimaru owes his popularity as much to his physique and particularly to his thick eyebrows, which look like those of the legendary samurai Saigo Takamori (1827 - 1877). Moreover, many fans have never stopped calling him "Saigo-san", and Musashimaru replies to the tribute with a masterful frowning grimace, to the laughter of the public. 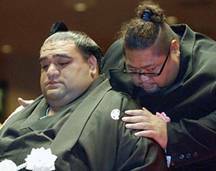 More than an exceptional fighter, it is a gentle giant, close to the public, that the sumo world has lost. 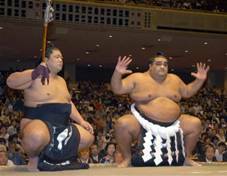 During Takanohana's absence, Musashimaru held sumo together while worthily maintaining his role of yokozuna. No-one has forgotten that and it was proper that the NSK, just like the public, should pay tribute to his amazing talent. For his danpatsu-shiki, Musashimaru, Fiamalu Penitani, invited all his family from Hawaii for an event that should be cheerful, including in its programme some Hawaiian folk songs and dances. Around 260 people, including Asashoryu and former ozeki Konishiki, had the honour of cutting the oicho-mage of Musashimaru, who was unable to hold back the tears when his training partners Wakanoyama and Musoyama climbed onto the dohyo. The only shadow over the scene was the mysterious absence of Takanohana oyakata, who was one of his great rivals. It was eventually his master, Musashigawa oyakata, former yokozuna Mienoumi, who had the honour of severing Musashimaru's mage permanently, under a storm of applause. With his short hair, it is not yet known what the inspired Hawaiian intends to do; he has the right to remain within the NSK for 5 years as Musashimaru oyakata. First of all, it won't be K-1, in line with Akebono, because he doesn't like kicks to the head! Nor will it be television like Konishiki, omnipresent on the small screen, since the man is too shy. 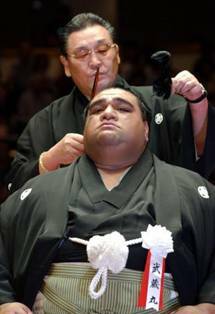 He simply adores sumo and knows that he will be unable to satisfy this passion in Hawaii, so he is relying on spending a while teaching sumo as Musashigawa oyakata. Beyond 2008, nothing is yet fixed for him, but one will be more likely to come across him on a beach in Hawaii than to see him running a heya! !